More recently I have been making images of the Heygate Estate (see Elephant & Castle and the Heygate button above) which is being demolished as I write this. In its latter years, the Heygate had a bad reputation and there was an enthusiasm for its demolition and replacement with something more in keeping with Southwark's view of itself in the new millennium. In the 1970s, the Heygate, and the nearby Aylesbury Estates were envisaged as places to house a broad cross section of the community. There were integrated shop units, laundries, public spaces and walkways in the sky, all of which should, in an ideal world, have created an ideal place to live. But something went wrong and the Heygate Estate gradually attracted a reputation every bit as grey and grim as its concrete exterior. It may have been the effect of Prince Charles' views about what contemporary architecture should be but, for whatever reason, as Southwark entered the new millennium, Southwark Council expressed a determination to erase the Heygate Estate and the demolition started in late 2012 and will probably be finished by late 2013. 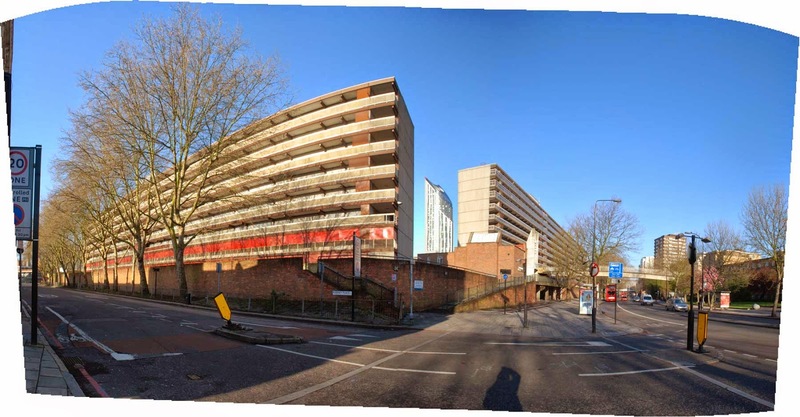 It is unclear what will replace the Heygate but what is known is that it will be mainly private rather than public or social housing and only time will tell if that model will be any more successful. It might be that, at some future time, we will look back and find that we miss the Heygate, its concrete brutalism and its walkways in the sky. Given that most people's memories are relatively short, I hope that these images will remind Londoners and visitors of what was there before and, at some future time, it may be possible to assess whether or not the Heygate was any better or any worse than its replacement.